A new accredited course specifically designed for architects and engineers introduces design considerations for incorporating solar photovoltaics (PV) into buildings, how to speak with clients about the benefits of solar PV, where to find information on financial incentives, and much more. The one-day training was developed by the Building Codes Assistance Project (BCAP), the Center for Sustainable Energy (CSE), and national solar energy experts, and is co-hosted by AIA Chicago and Illinois Green Alliance. Special offer: Register with a friend and both tickets are 50% off. 6.5 AIA LU/HSW and 6.5 GBCI provided. For more information about the course and registration, contact Maria Ellingson at mellingson@bcapcodes.org. America’s demand for solar energy is spreading – and fast. In just the last eight years, solar electricity generation has increased 30-fold and solar jobs are growing 12 times faster than the rest of the economy. While the cost of photovoltaic (PV) panels has been steadily and rapidly declining, the other soft costs – such as permitting, installation, labor, grid connectivity and other indirect costs – can account for up to 64% of the cost of an installation. BCAP and the Center for Sustainable Energy (CSE) have been selected by the U.S. Department of Energy to provide solar training to architects and engineers in 22 key metropolitan areas across the U.S, including Chicago. This project will utilize a train-the-trainer approach to deliver education and resource access to designers with the goal of ultimately reducing the indirect costs of solar transactions. 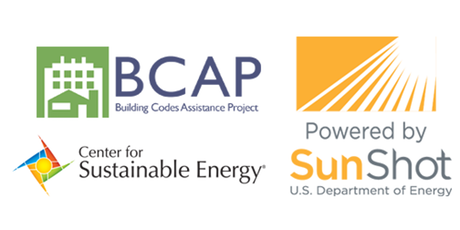 BCAP’s role in the initiative spans two years and is designed to give these professionals the tools they need to incorporate solar into their designs. When architects and engineers better understand how solar impacts their day-to-day work, they can support solar growth and eliminate barriers to widespread acceptance. This project aims to help achieve the U.S. Department of Energy SunShot Initiative goal of reducing the total installed cost of solar energy systems to $0.06 per kWh by 2020 by reducing the soft costs in solar installations. The goal of this project is to identify and eliminate barriers to widespread solar acceptance and to support strong growth in the solar sector. Building design professionals are ideally suited to make solar energy part of the dialogue during the design phase of new buildings. Incorporating solar directly into building designs reduces the overall cost, including the expense of permitting, installation and labor, and will support the continued growth of solar energy technology. Having more solar energy seamlessly integrated into building design can also increase consumer satisfaction and confidence in solar as a safe and reliable technology. With knowledge and access to information and resources, design professionals can help reduce the soft costs and make solar more affordable.